Åland is a great place for those that want to be close to nature, test their strength, breathe fresh air, and take on new challenges. The 6,700 islands give you experiences in nature that you won’t forget. The sea is always close by. 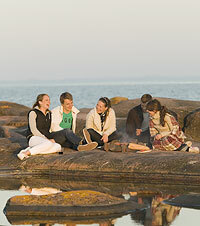 This means that Åland can offer its visitors a fantastic island world with a varied archipelago landscape. Here you’ll find everything from red granite and the harsh outer island archipelago, to forests and lush forest meadows. There are many adventures waiting in the Åland island world. Paddling, hiking, shipwreck diving, long distance skating and hiking are just a few examples. In just two hours you will travel to Åland with Eckerö Linjen and only one click from here we give you many reasons to book the rest of your holiday with us. You can call it a wide range of options. We call it complete travel packages!